Dogmas’ Visual Novel Maker (VNMaker) was a surprise. At first, glance flashed back soft summer nights staying in, playing RPG Maker on PlayStation, creating my own stories and quests using a friendly if not limited utility designed for ease of use. Upon playing VNMaker, I realized this wasn’t the case. Not a bad thing, per say; I just wasn’t expecting a program for visual novels to share so many similarities with RPG makers. I was, however, expecting novelty. Built-in tutorials that accustom to core mechanics, a cutesy stylized interface, something that would let you put together a silly little digital bit to show off to your friends. For starters, VNMaker is as professional looking as programs get. It sports a sleek interface that resembles a Mac program, from the loading bar animation to the rounded edges of the buttons. It's evident that the design team wanted it to look at home on a Chrome laptop. And not wanting such gift to go to waste, I drove out to my local chain store coffee shop and reserved a table for the day. On startup, you're greeted with a screen that lists your most recent projects and allows you to load a few sample ones that showcase specific features of VNMaker, like conversation scenes or sequences where you can input your name and age. Then are sample scenes, like the one featuring a fully functioning game of Blackjack. Together these samples substitute the more conventional tutorial -- which isn't to say they are useful, but a guided video or a starter project would have been helpful as well. Trying to create a new project prompted an error code: this project was “created with an older version of Visual Novel Maker and cannot be opened without a migration.” To be fair, I received the review code prior to launch, and so I hope the error was patched out before the release date (November 16, 2017). Once the error bypassed and the project loaded, I was treated to a U.I. that felt a lot like using a video-editing program in the likes of Final Cut Pro and Sony Vegas. "That's good news," I thought, as both make for excellent choices to story-builders into the movie thing. In contrast, I learned that the story is formed using a downward-floating timeline, as opposed to left to right. It's good design in that it does make sense: in the context that every event added contains multiple fields to fill out and control the variables of each action, seeing them side by side could get clustered and confusing. Scenes are separated and listed in a box on the upper left, underneath is another where events are organized by purpose, with color-coded tabs which make sorting out actions and finding your next sequence quick and painless. That I would honestly like to see in my video editing programs. Bonus point. Furthermore, every feature has a short name that is self-explanatory. Within 40 minutes of gameplay, I had a cute little scene ready to go. One I could easily export and send to my friends, complete with saving and loading if my 10-minute odyssey proved too tiresome. 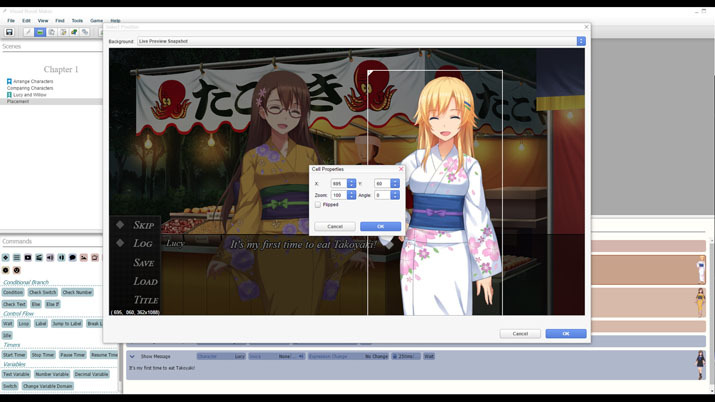 VNMaker makes the exporting process easy. Programs can be processed to fit a variety of platforms such as Windows, Steam, AppleOS, and web browsers. The custom story I toyed around with utilized a library of assets that come with VNMaker. Backgrounds, Characters, and Music all have a small pool of set resources to choose from, but custom assets can be added in to give it your own style and flair. VNMaker is a perfectly functioning tool to use if you’re looking to weave together your tale. 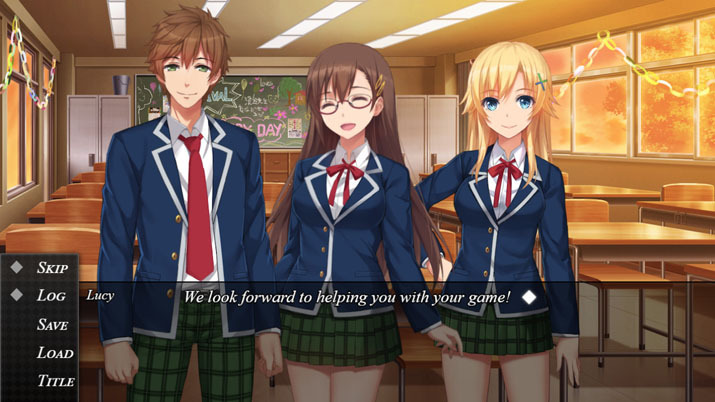 It provides freedom in the medium of visual novels, offering a wide spread of options and inputs that all assist in creating a story worth telling. My time spent with it was short, and I never made a fully functioning game of blackjack like in the tutorial, neither did I create an epic tale of love and deceit. But, I was surprised. I expected it to be limiting; I thought maybe it would be simple, something to toy around for a couple of hours. What I found instead was a well designed, multi-layered program. A fully functioning device that is easy to learn even without a tutorial. Mike was first on the scene with a SNES and kept up-to-date on the hottest games thanks to his older brother’s shared love of all things video games. He loves staying in on rainy days with classic horror games like Silent Hill or Clocktower, but has experience across the the gamut of genres, from racing-sim to rhythm-action. He is always looking for new and different experiences, both in gaming and real life. His go-to genre is platforming, but he also enjoys a good FPS or puzzler. When he’s not holding a controller, he enjoys sushi, fluffy dogs, cold lemonades, and urbexing.